SPECS: Fits 1911, Government & Officer. Stainless steel body, polymer/steel follower, welded & polymer base pad. Dane techniczne: pasuje do 1911 roku, rząd i oficer. Stali nierdzewnej ciała, zwolennik polimeru/stali, spawane i polimer bazowy pad. 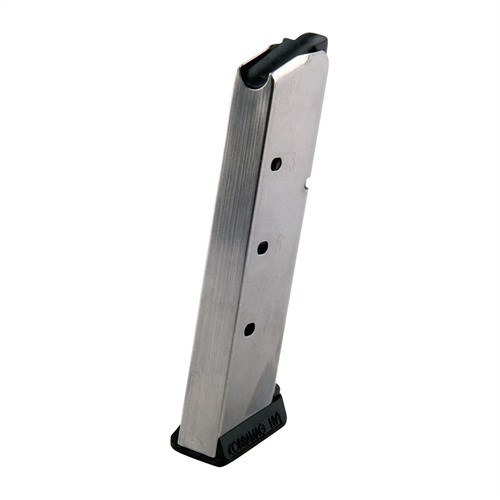 I use these mags in my Springfield Micro .45 ACP. They work better than the original magazines. They hold one extra round over the factory mags. Tripp does this by using his patented follower and a special spring. These work so well, I ordered replacement springs and followers for my factory Springfield mags. I use this as a L.E.O. off duty pistol and it is nice to have the extra round in a flat bottom mag. I had a mixed collection of magazines (none Colt) for a 1991 compact model...some worked fine, others not so much. Colt mags were out of stock and I had heard good things about Tripps. Ordered three and used all this past weekend...excellent product, no issues, high quality and reliability. May get the Tripp parts to upgrade the old ones that I have. disclosure: I bought a "removable base" Officer magazine from Tripp Research for my tests, and they were interested to get data on this one, so I got the "welded base" for free. I have since bought more of them, but the first one was a gift. I had doubts about a 7 round flush fitting magazine for Officer size. But I just could not make this fail. It ate all HPs and RNs that I tried, both in manual tests and in live fire. Not a single malfunction. I'm sure it will fail at some point - everything does - but this is the only reliable flush fitting Officer size magazine that I have seen so far. And I have tried all major brands except Colt. Like it's big brother the 8R, this magazine always works. I have used it in my Springfield Micro .45 and the Kimber ultra. It functions perfectly in both. Yes, the bottom is a little longer than the flush mags. The extra length allows the special spring and follower to hold that extra round. I carry one in my Micro and as a spare when off duty. 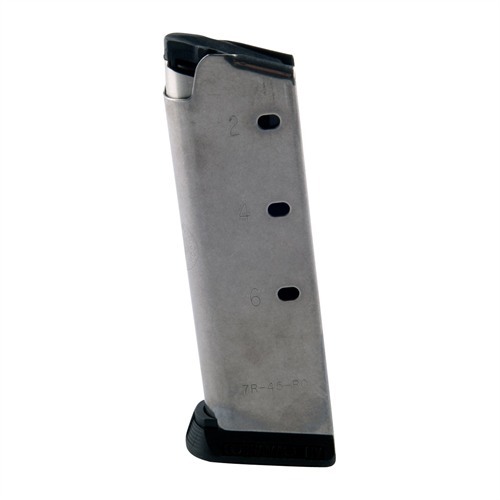 The are the best made 45 mags I have seen and used in 40 years of shooting. I have tried all major manufacturers. 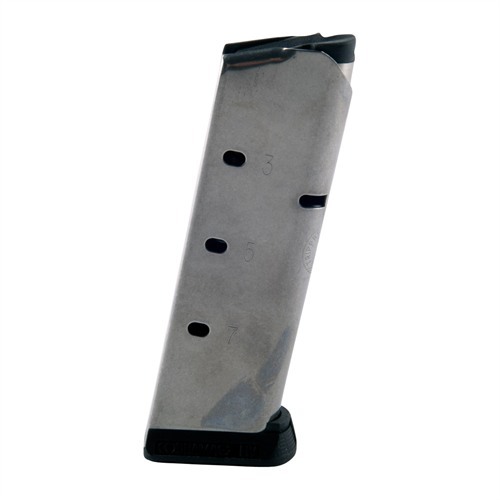 There are only two Officer size magazines that pass all tests - this and the other one from Tripp Research. Feeds all HPs I tried, smooth and cluck-less. Bought this mag for my Kimber Pro Carry II as a primary carry mag. The build quality is great, the follower works. Period. Locks the slide back every time, no mis-feeds. Tight lock up, high polished stainless and drilled/tapped for base pads. Buy one, you'll be ordering more. These are absolutely the best magazine for the 1911. I used these last weekend in a Cowboy Action Match where the 1911 was used extensively. With the Tripp magazines there were no feeding problems and they ejected from the pistol every time. (For the record I am using a cheap ($300) parkerized High Standard Government model 1911 with absolutely no upgrades to the pistol.) The only money I spent was on these magazines. You cant go wrong with these. I will be buying some for my work pistols. Mags work just as well as any other high end magazine. I do like the hybrid follower, it appears to give some addtional life as the slide stop impacts metal, and not polymer. Excellent product. The follower is an excellent design. The metal insert for the slide stop shouldadd quite a bit of life to the follower. Fits my kimber perfectly, and drops free without a problem. The witness holes are a great design, with even on one side odd on the other. I like being able to see all the rounds as well. The base pad is very nice and they work as advertized. Fit is very solid and with the button pushed in, the pad slides off for cleaning. fit and finish doesn't get much cleaner. I will definitely be buying several more of these. 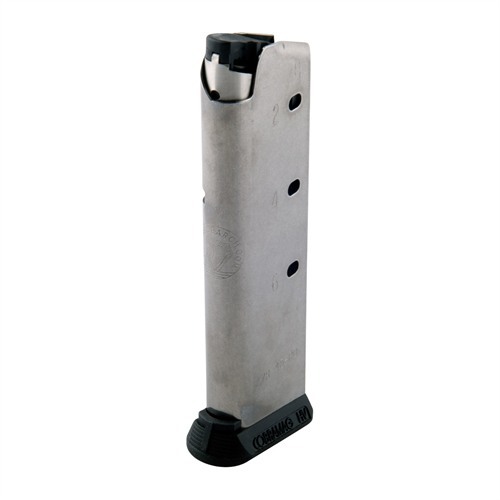 I do prefer flush fit mags for my concealed carry gun, but Tripp makes flush fit mags as well, they just don't carry them here yet. The body of these magazines are longer than other 8-round 1911 magazines allowing for a full length follower and longer spring. While most 1911's are picky with the types of magazines they like, I've found that nearly all like Tripp Cobra mags. Many times I've been at a match or the range and a new 1911 owner is experiencing FTF or nosedives, I've let them try a Cobra mag the the issues are resolved. These magazines just work. I have shot the 1911 platform for almost 40 years. I have used comp pistols in IPSC, standard pistols in law enforcement carry, and I carry one every day for self defense. For years I used Wilsons. I followed through their development and growing pains. About five years ago another law enforcement trainer suggested I try the Tripp Cobra. They are without a doubt the best I have ever used. I have used them in a Springfield TRP, Champion, and Micro, in my Kimber Pro Eclipse and in my Colt Gold Cup. The 8R always function. I have not found a barrel or ammunition that they will not work in. If the military tired these, the rest of us would never be able to get one. Yes they are a little longer but this allows the special follower and spring to do the job of carrying an extra round without failure. I carried one for years in my Kimber when I was a detective and never had a problem concealing it. It I simple. These mags always work. Yes they are longer but they are designed this was to accommodate the follower and spring. If you are worried about concealabilty, carry a flat bottom in the pistol and use this as your change out. I have used these mags in Kimber Pro, Springfield TRP, Springfield Champion, Colt Gold Cup, and a Springfield Micro. I carried them as my primary and backup mags as a detective. I think Virgil Tripp had this design before the Wilson. If the military tried these, the rest of us would never be able to get them. I have used four 8 round, and two 10 round Tripp magazines for the last two years. Yes, they are a little long, but I carry a full size Colt every day w/tripp mags, and it is doable. As everyone else says, they just work every time. I am a 1911 Pistolsmith, Harp Custom. And I can tell you that these magazines have the proper feedlips to release the round at the correct time and the follower is so well designed to not tilt nor get worn from elevating the slide stop lever like the other plastic mag followers from other companies. This is the best 8 round magazine I have ever used. I just wish I had known about these before I retired from law enforcement. Another manufacturers 8 round mags did not work too well and I just gave up and went back to the old reliable 7 round. And, as usual, Brownell's service was fast and the prices cheaper than other places. Pros: Quality construction and excellent performance. Use in Colt Govt 1911 (circa 1934), as well as 1911A1 Mk IV series 80, a Combat Commander, and Springfield LW Operator. Additionally, am using .38 Super Tripp Cobra mags in Colt Govt Mk IV series 70, and the .45 ACP Officer model Tripp mags in Kimber Ultra Carry II. As a retired law enforcement firearms trainer, current CCW Instructor and long time USPSA competitor I think I've seen and handled just about every 1911 magazine available. These are simply the best. In fact, when I have clients with unreliable 1911 pattern weapons I frequently loan them my magazines and observe that their pistol works with Cobra-Tripp magazines. These magazines lock the slide back when empty with unfailing reliability. I run these in my 1911's in .45, .40 and 9x19. I'll never purchase anything else for a 1911 pattern pistol. Designed and manufactured the way a 1911 magazine should be. The feed lips do not cause the cartridges to nosedive, even when the magazine is loaded to capacity. The magazine body is polished and smooth, no burrs or dents. Easy to disassemble and clean. A little more expensive than some, but worth the money for something that you know will work. I was having trouble with another top brand of magazine at a shoot. I asked a world champion shooter of my sport, who was there, what type of magazine he recommended. It was "Tripp Research Inc". I have had NO problems with these magazines. They work in my Springfield and an older custom 1911 that I have had for 25 years. Excellent Magazines! I really like the Hybrid followers in these. Great construction, excellent follower design and base pad. Magazine functions flawlessly with all ammunition types in my 1911, better than any Wilson, Chip, or Checkmate magazine ive used. I purchased three Tripp 1911 magazines when they were on sale a few months ago to accommodate my growing 1911 family. They exceed, in quality, any of my "OEM" or Wilson mags. Smooth as silk to load and have performed flawlessly (even in the cold of a New England winter). In my opinion Tripp mags are the best you can buy. Buy one to try it out and you will be back to buy more. Bought 3 before a 4 day tactical handgun course at Front Sight in Nevada. Shot over 800 rounds in 4 days, with my Les Baer 1911 and these were my go to magazines. Never had a single malfunction during or after my trip. Continue to use them for training and the feel of the magazine and functionality are superb. The magazines are very well made and work reliably except, they will not hold open the slide on my springfield Armory TRP operator. They try to catch the slide but fail. I was about to return my new Monolith Heavyweight 1911 to Les Baer due to repeated malfunctions with the factory magazines (after the 500-round break-in). I was using the factory-recommended ammo (American Eagle 230gr) and lube procedure (CLR), but was getting misfeeds and failure to lock back slide after last round. Tried a different ammo (Speer Gold Dot 230gr), but did not fix issue. On a recommendation I purchased two TR Cobra mags. The superior fit-and-finish was immediately apparent. I loaded them with the exact same ammo, and the pistol went through 200 rounds without a hiccup. I will continue to test, but so far these magazines have performed flawlessly. They ARE pricey, but no more so than Wilson Combat. If you're a believer that aftermarket mags make a difference, I can highly recommend these.